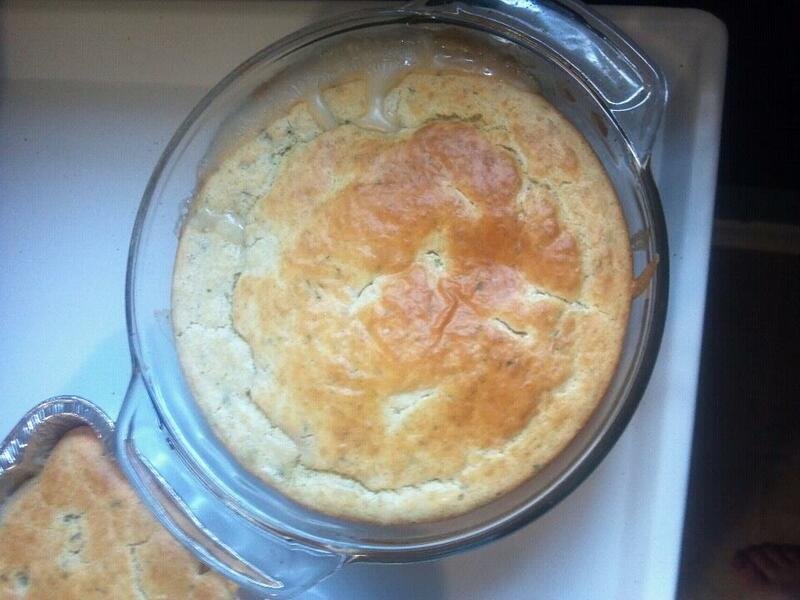 Is there anything more warm and homey than a chicken pot pie? I don’t think so. And one day back in September, I really wanted that domestic feeling. But now that it’s after Thanksgiving and I have a pile of turkey in my fridge, it’s the perfect way to dispense with my leftovers. Cut the chicken breast into cubes. Or if using leftover turkey, shred it. Season to taste with seasoning salt. Coat the meat in a thin layer of flour. [You can season the flour with more seasoning salt and black pepper before coating the chicken/turkey if you want.] Put a bit of olive oil on the bottom of the pan. Enough to coat the bottom of the pan, but not deep fry. When the oil is hot, toss in the chicken cubes/turkey and let them turn golden brown. You can take the chicken out of the pan if you want, or if you’re lazy like me just push them over to the side of the pan in a pile. 🙂 Next, pour a little more oil into the pan and throw in the onion and celery. Sweat them until the onions are translucent. Make sure not to brown them. Take a moment to taste your mixture. Add salt and pepper to taste. If you’re using canned soup, it will have plenty of salt in it, so don’t season until after you’ve combined the soup into your mix. When it reaches the consistency you want, take it off the heat and grab your casserole dish. I used a round 9″ casserole. But I’ve also done this in a square casserole. Both work fine. Leave the casserole un-greased. Pour the filling mixture into the casserole. Tap it on the counter to get any air bubbles out. In a separate bowl combine the Bisquick, milk and egg. Once it’s like pancake batter, season with sage, parsley flakes and salt. You can add a bit of pepper too if you like. Pour this mixture in an even layer over the filling. If your filling is thick enough it will sit right on top of it without sinking down. If you you like, you can cut up a couple of tabs of butter and sprinkle over the top of the Bisquick mixture. Just adds a tiny bit more flavor to the crust. Bake in a 350 degree oven for about 30 minutes or until the crust is golden brown. Eat immediately or store covered in the fridge. Or you can freeze it. I’d say it’ll be fine frozen for up to six months. If you use this recipe, give me some feedback on it. What did you change? What did you like or not like about it? Comment below. While I’m on the subject of cooking and freezing, let me tell you about a nifty website I use with my friends. Crowd Kitchen makes sharing food with your friends easy. You can simply make a double batch of whatever you would normally cook, freeze the extra portion and then trade it with a friend. You get something they make in exchange. For your single effort, you get two meals. You also get a variety, which for me, is great. I tend to fall into a rut when it comes to cooking. I have meals that I have mastered and always taste great that I could make with my eyes closed. So I stop searching for new and interesting ways to cook. Trading with friends can increase your culinary repertoire. I had no idea how to prepare lentils until I started trading with my friend, Tim. You can set up your food allergies or preferences in your account and search for available dishes by these perimeters. Or if you prefer to only trade with people you actually know, you can make your dishes available to just your friends. Crowd Kitchen even allows you to use Facebook to log in so you don’t have to remember another damn password. It’s a great option for me. Perhaps it would be for you too. Check out their website and find out more for yourself. You guys, I just don’t have it today. I’ve got three meetings at work this week. And I want to write my 8 month letter to Gibson, but I just can’t do it justice this morning. So I’m re-blogging a post from two years ago. Now that the weather is finally cooling off, this recipe has been on my mind a lot. If only I had the time to cook it!! !